The Arizona Diamondbacks visit Wrigley Field on Tuesday, August 1, 2017 to play the Chicago Cubs. The probable starters are Patrick Corbin for the Diamondbacks and Jon Lester for the Cubs. The opening line for this matchup has Arizona at +167 and Chicago at -177. The Diamondbacks have a 46-53-6 over/under record and a 60-45-0 run line mark. The Cubs are 43-61-0 against the run line and have a 47-53-4 over/under record. The Diamondbacks have a 60-45 overall record this season. Starting pitcher Patrick Corbin has a 8-9 record with an earned run average of 4.36 and a WHIP of 1.51. He has 112 strikeouts over his 119.2 innings pitched and he's given up 145 hits. He allows 10.9 hits per 9 innings and he has a FIP of 4.19. The bullpen has an earned run average of 3.44 and they have given up 283 base hits on the year. Teams are hitting .234 against the bullpen and they've struck out 322 hitters and walked 112 batters. As a team, Arizona allows 8.1 hits per nine innings while striking out 9.3 batters per nine innings. They are 2nd in the league in team earned run average at 3.43. The Diamondbacks pitchers collectively have given up 842 base hits and 357 earned runs. They have allowed 107 home runs this season, ranking them 29th in the league. Arizona as a pitching staff has walked 322 batters and struck out 971. They have walked 3.1 men per 9 innings while striking out 9.3 per 9. They have a team WHIP of 1.24 and their FIP as a unit is 3.66. As a team Arizona is hitting .257, good for 13th in the league. The Diamondbacks hold a .444 team slugging percentage and an on-base percentage of .331, which is good for 9th in baseball. They rank 12th in MLB with 8.8 hits per game. Chris Owings is hitting .268 with an on-base percentage of .299. He has 97 hits this season in 362 at bats with 51 runs batted in. He has a slugging percentage of .442 and an OPS+ of 84. 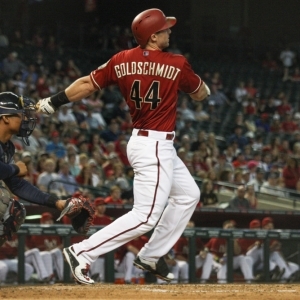 Paul Goldschmidt is hitting .316 this year and he has an on-base percentage of .437. He has totaled 117 hits and he has driven in 78 men in 370 at bats. His OPS+ is 152 while his slugging percentage is at .570. The Diamondbacks have 929 hits, including 214 doubles and 134 home runs. Arizona has walked 370 times so far this season and they have struck out 956 times as a unit. They have left 735 men on base and have a team OPS of .774. They score 5.03 runs per contest and have scored a total of 528 runs this year. Chicago has a 56-48 overall mark this year. With an earned run average of 3.88, Jon Lester has a 8-6 record and a 1.21 WHIP. He has 130 strikeouts over the 130 innings he's pitched. He's also given up 118 hits. He allows 8.2 hits per nine innings and his FIP stands at 4. The bullpen has an earned run average of 3.34 and they have given up 278 base hits on the year. Teams are hitting .210 against the Cubs bullpen. Their relievers have struck out 396 batters and walked 163 opposing hitters. As a team, Chicago allows 7.9 hits per nine innings while striking out 8.8 batters per nine innings. They are 7th in the league in team earned run average at 3.93. The Cubs pitchers as a team have surrendered 819 base knocks and 406 earned runs this season. They have given up 124 home runs this year, which ranks 21st in Major League Baseball. Chicago as a staff has walked 358 hitters and struck out 907 batters. They give up a walk 3.5 times per 9 innings while they strike out 8.8 per 9. Their team WHIP is 1.27 while their FIP as a staff is 4.22. As a team, they are batting .244, good for 24th in the league. The Cubs hold a .430 team slugging percentage and an on-base percentage of .328, which is good for 13th in baseball. They rank 25th in MLB with 8.3 hits per contest. Anthony Rizzo comes into this matchup batting .257 with an OBP of .387. He has 96 hits this year along with 67 RBI in 373 AB's. He maintains a slugging percentage of .509 with an OPS+ of 132. Javier Baez is hitting .263 this season and he has an OBP of .303. He has collected 75 hits in 285 at bats while driving in 40 runs. He has an OPS+ of 97 and a slugging percentage of .467. The Cubs as a unit have 859 base hits, including 179 doubles and 145 homers. Chicago has walked 393 times this year and they have struck out on 877 occasions. They have had 732 men left on base and have an OPS of .758. They have scored 4.65 runs per game and totaled 484 runs this season. Who will win tonight's Diamondbacks/Cubs MLB game against the spread?